This Pylon is approx. 7 ½ ” tall and features your artwork in full color from any jpeg file. 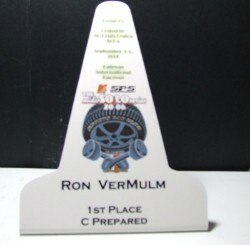 Can be customized with each name and place with an add on sticker than can be mailed to each trophy winner economically and easily after the event.